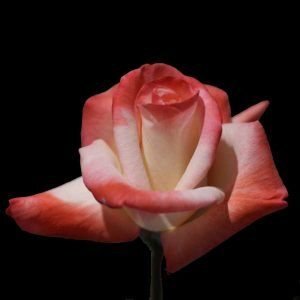 A pink and white hybrid tea rose, the Gemini rose is a very strong growing rose with desirable bi coloured flowers. The pink is strong and contrasts well with the creamy white. Fragrance is mild yet pleasant. This is a double flowering rose, 20 plus petals and a good shape especially when first opening. The name Gemini (The twins of the Zodiac), reflects the twin colours of this magical rose.. The bush itself is reasonably vigorous and can reach 2m metres plus, usually around 1 . 5 metres. The attractive deep green glossy foliage acts as a good contrast to the flowers. The flowers themselves are great in a vase. Very easy to grow, and disease resistant. The only real care required is pruning and an annual application of rose fertiliser. Suited to growing in containers and an excellent plant for a patio. If you prepare the soil well before plating the Gemini Rose will be easy care. Dig in some well rotted compost a few weeks before. Water in with a liquid seaweed fertiliser and water deeply once a week through the first summer, allowing the soil to dry a little between waterings. Mulch around the rose to maintain moisture and a cool root run. Fertiliser – Use a specialist rose fertiliser in spring. Pruning is much the same as other roses. Remove any dead or damaged canes. Prune the remaining canes back by 1/3. Every second year prune some of the oldest canes right back. The Gemini Rose is available for sale from the following participating nurseries.